The best of Golf brings to you the rich history, ancient tradition and soul of the game like no other golf publication. The award winning editorial escorts you down the fairways of the world's finest resorts and golf communities. You will see stunning photography of classic courses. 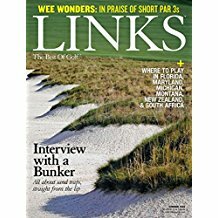 Links is the ultimate destination for everything golf travel, golf resort, golf history, and course architecture-related.